Ireland and Leinster will be without O'Brien for an extended period of time. LEINSTER HAVE CONFIRMED that Sean O’Brien faces five to six months on the sidelines as he gets set for shoulder surgery tomorrow. 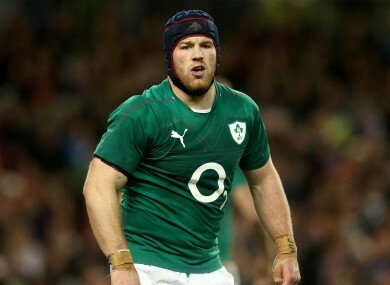 The Ireland back row will undergo a second shoulder reconstruction on the same injury that saw him miss much of the latter half of last season. O’Brien initially injured his left shoulder in December of 2013, having an operation early the next month to reinforce the dislocated joint. However, with the injury not having healed to the satisfaction of the Leinster medical team due to an infection post-surgery, he is now forced to have a second procedure. The back row did make a return for Leinster at the tail end of last season, and featured against the Glasgow Warriors in the opening game of the current campaign. However, the shoulder issue and an ankle problem have seen him sidelined since. O’Brien last played for Ireland in the November Test defeat to New Zealand at the Aviva Stadium, having also started against Australia the previous weekend and appeared off the bench versus Samoa at the start of the same series. Email “Sean O'Brien set for five to six months out following shoulder surgery”. Feedback on “Sean O'Brien set for five to six months out following shoulder surgery”.